Imagine spending a week in the middle of nowhere with 13 Beverage antennas  each roughly a kilometer in length and capable of hearing hundreds of rare stations. It's possible because we're making our famous AM DXpedition base in Aihkiniemi, Finland, available for rent to other DXers as well. 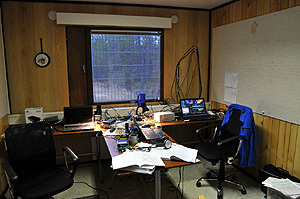 Aihkiniemi became the first ever purpose-built AM DXpedition base in Scandinavia in 2010. Most of the construction work was done in the summer of 2010, but both the cabin as well as the antennas have been improved continuously since then. We want you to succeed and we'll do everything to make your DXpedition as comfortable and successful as possible. Visiting Aihkiniemi is as easy and as memorable as a DXpedition can be because we've already made the investments and done the hard work for you. Forget the drudgery of spending days setting up the antennas and get right into the business of unforgettable AM DXing! As you can imagine, Beverage antennas of this length are very directional on the AM band, so during good conditions you have to choose what you want to focus on. The same antennas can also be used for shortwave listening. Below is our aerial setup on a Great Circle Map (click for a larger version). The antennas from 255° to 46° are spread out on the northwestern side of the main road on a flat but otherwise very challenging terrain with forest, dense brush vegetation, small lakes and swamps. The rest of the antennas are located on the southeastern side of the road in a bit hillier terrain where the forest is much easier to walk in. The antennas are hung a few meters off the ground. The antennas hang 35 meters above the ground to prevent reindeer and moose from getting stuck in the wires. 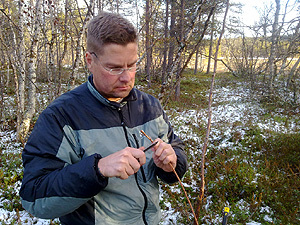 You should inspect all of the antennas at least once during your DXpedition week to clean them from snow and ice, and to make sure that the wires are sufficiently off the ground and place additional sticks to lift low-lying wires, where necessary. Having a reindeer hanging in a low-lying wire would be a nightmare scenario, in terms of our community relations, which we need to avoid at all costs. We have a rowboat to take you over the tiny lake, or in the winter you can get to the other side using a small bridge a few hundred meters away downstream. Don't try to walk across the ice, because it remains treacherous even in mid-winter. Once you've made a reservation, we'll email you a detailed map of the antennas and cabin surroundings. You'll also get more detailed information on the type of connectors used and answers to any housekeeping questions you may have. All antennas are grounded and fed into an impedance transformer, from which a coax cable leads into the cabin. Inside the cabin, all coax wires are HFX50, which is more resilient towards radio-frequency interference (RFI) than the common RG58. One of the antennas (321 degrees) is equipped with a toroid-based RF choke. Inside the cabin, you'll need to handle the coax connectors very gently. Rough handling and unnecessary plugging/unplugging of the cables can cause a major headache to the following crew. Jim Solatie peeling copper for grounding. Please note that this is wilderness and things happen. Although we work on it year-round, we can't guarantee that all of the antennas will be in working condition when you arrive. Bears, moose, reindeer and rabbits have all wreaked havoc with our antennas at some point (mostly cutting or damaging the coax cables on the ground). If you encounter problems, please let us know so that we can fix it as soon as one of us has an opportunity to travel north. Even if a couple of the antennas are out of service  and you can't find a way to fix them  there's still an abundant array of wires that will keep you busy DXing. The cabin is equipped with an excellent ground wire that should be used to ground also the antenna switcher. There's also a grounding panel where all unused antennas can be attached to reduce interference. To minimize RFI, there are currently several laboratory-grade power supplies for your laptop computers and external hard drives. However, using hard drives which are powered via USB is recommended to eliminate one potential source of RFI. Because the level of electromagnetic interference in Aihkiniemi is extremely low, you may notice that some of your own equipment cause RFI which you haven't been able to detect at home. There is also a separate power supply to provide 5V DC for Perseus receivers. Several laptops are available for DXing, but they should not be connected to the Internet. If you do bring a laptop of your own, which is recommended if you want Internet connection or wish you to use your favorite pre-installed SDR software, note that you also need a wire connecting the power supply to your laptop, as laptops have a variety of different power plugs. You will also find a MiniVNA which you can use to analyze antenna performance. Additionally, we have splitters to give both listeners access to the full array of antennas, but you should bring your own preamp if you wish to use one. Preamps are recommended, because there are very few AM stations in northern Europe, and you can usually boost the signal without overloading a decent communications receiver. If you've never experienced a DXpedition in Lapland before, the AM band may initially sound confusing. It's very different from Central Europe, for instance. You're likely to enjoy a very undisturbed band and be impressed with the multitude of far-away stations both in the morning and afternoon. On the other hand, a location in the far north means that the AM band can become almost dead silent during a solar storm. In any case, you're in for a lot of surprises, and conditions are likely to change from day to day. A week should provide enough time to overcome a solar storm and still enjoy some decent conditions at some point of the week, which is why we wouldn't recommend going through the trouble of traveling up there for only a weekend or so. The DXing room has enough space for two DXers at a time. The main target areas in this Arctic location are the Americas, Pacific, Far East and Southeast Asia, but of course hundreds of AM stations from Europe and the Middle East are also audible. The following is a review of what you can expect to hear during a typical 24-hour cycle under average conditions. Most listeners travel to Lapland taking the overnight train, so a new crew normally arrives in Aihkiniemi at the earliest around 2 p.m. (on a Saturday which is when a weekly reservation begins and ends), by which time the previous crew has already left to catch the evening train. Setting up your gear will take some time, but during the first day you'll still have time to get a taste of the Eastern Hemisphere. From November to February, the first stations from the Far East can appear as early as 09001000 UTC, and Asian stations can be enjoyed until around 14001700 UTC, when stations from the Middle East and Europe gradually take over the AM band. Be alert for local breaks, such as NHK2 station identifications at closing time (at 1600 UTC or before). Indian stations can be best identified around sign-off time at 1740 UTC or after 0023 UTC sign-on. Sub-Saharan AM stations are notoriously difficult catches because Central European stations tend to dominate the same frequencies. Our extensive antenna farm is not very helpful because European stations are in the same direction, so don't count on getting many African stations, except in the case of solar storms. Your best shot to catch sub-Saharan African stations is to watch for Ethiopian stations signing off after 2100 UTC; Nigerian, Mozambican and others signing off around 22002300 UTC, and stations from Sudan and Ethiopia signing on around 0300 UTC. Jim is hunting for new AM stations. The first signals from the Americas appear around 20002200 UTC. They're usually from Newfoundland, Venezuela or northeastern Brazil, depending on the direction of the conditions. Gradually targets from further west appear on the dial. 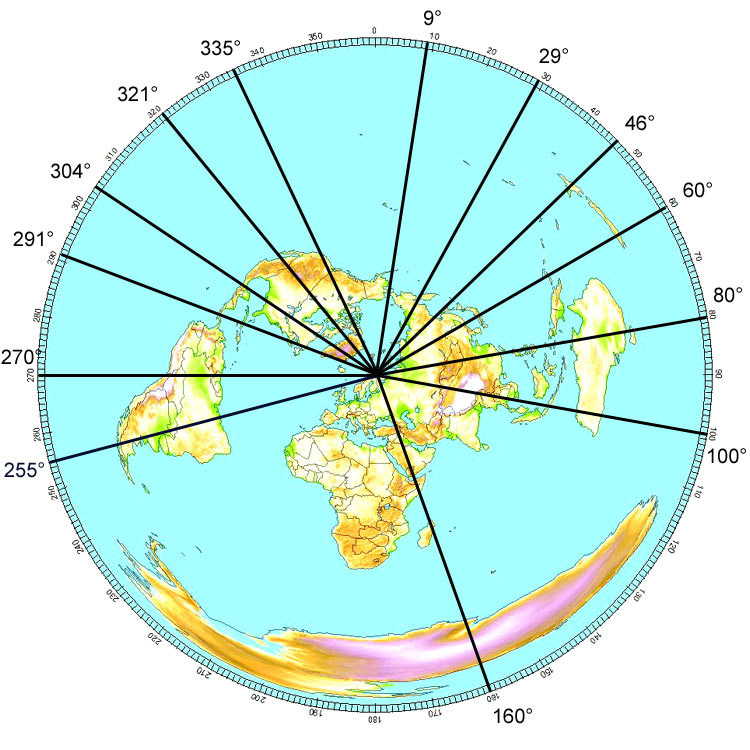 Overnight conditions vary a lot, but the peak listening time to the Western Hemisphere falls after sunrise Finnish time, around 06001000 UTC. If conditions are good, stations can be heard at almost every 10 kHz throughout the AM band. A true feast! Even during poor conditions there's usually a short peak in conditions at daybreak. In midwinter, the sun remains below the horizon, but DXing conditions are similar. During good conditions, North American stations from the West Coast can be heard until 15001600 UTC, and Alaskan stations even later. The strong signals from Alaska will give you chills. Around midday Finnish time is the best time to hunt for stations in the Pacific, which tend to be overcome by Asian stations later in the afternoon. The Southern Pacific is on the opposite side of the world, so it is a rare treat, with V7AB on 1098 kHz being the most common catch. During less than ideal conditions, the AM band can be completely silent for hours during daylight hours. Take it as a good opportunity to get some exercise, check the antennas and enjoy the Arctic nature. During very severe solar storms, transatlantic signals can become inaudible for days. If you're interested in European stations, the morning hours around 0600-0800 UTC are best for Spain and the U.K., which have loads of local stations. They can also be heard in the evening hours. So when do you sleep if interesting stations are heard 24/7? 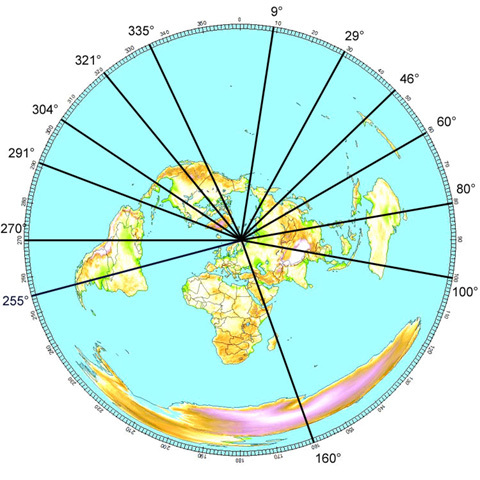 We usually sleep around 17002000 UTC and again around 02000500 UTC. If you trust your instincts in antenna selection, you can of course sleep through the night and have your SDR record overnight. The most interesting DX sessions are after sunrise and before sunset, which need to be monitored carefully. The bedroom sleeps two comfortably, but there are also two spare beds, so temporarily even four people can stay overnight. How many new AM stations are you going to catch during one week in Aihkiniemi? It is difficult to predict, as it all depends on your experience, persistence, equipment, the solar weather, and pure luck. 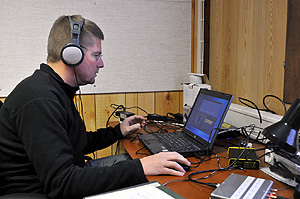 We'd say that if you haven't visited a Scandinavian DXpedition base before, if you are equipped with an SDR receiver capable of recording the entire AM band, and your week happens to be average in terms of reception conditions, you can expect to record hundreds of new stations. Even though we've been on dozens of DXpeditions in Lapland, we'd still expect an average week in Aihkiniemi to yield around 100 AM stations that we have never heard before. For examples of what can be heard in Aihkiniemi, check out reports of recent DXpeditions in Aihkiniemi: AIH3, AIH7, AIH10, AIH17, AIH18, AIH29, AIH39, AIH72, AIH76, AIH85, AIH88 and AIH98. 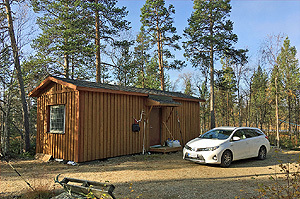 The 30-square-meter cabin in Aihkiniemi has two rooms: one for sleeping and the other is for cooking and DXing. 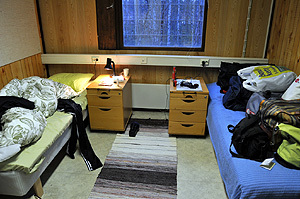 There are two beds, so the cabin can comfortably accommodate two DXers at a time. In addition, there are two spare beds, but using them leaves hardly any floorspace, so housing more than two is definitely not recommended. 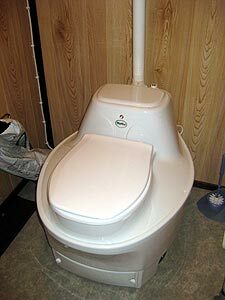 Between the two rooms there is an indoor composting toilet, which works great and is odorless. It needs less maintenance if you pee mostly in the forest outside and only use the toilet for number two. You will find English-language instructions for use. Two doors separate the bedroom and DXing room, so any DXing/cooking activities will not disturb the sleepier one too much, although earplugs are still a good idea. 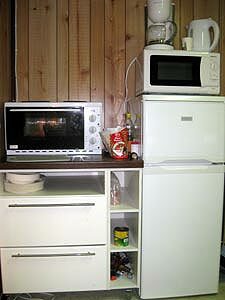 The kitchenette includes an electrical hot plate with an oven, a new induction stove, some closet space, a microwave oven, a coffee maker, a water heater, a fridge with a freezer compartment, and basic cooking and kitchen utensils. You can use the outdoors as a spare freezer, if you need one. Rest assured, the bears are asleep in the winter. The cabin has electrical heating and is warm even when it's extremely cold outside. Heating is very expensive, however, in case you wondered what you are paying for, in addition to the antennas. There's no running water in Aihkiniemi. The previous crew will leave you some drinking water. You can get more from Matkapaikka Jounila (a few km to the southwest), which offers lodge-type accommodation. For an off-season fee of 15 euros/person/visit you can take a shower, wash your dishes, get more drinking water, and watch TV, but not stay overnight. Another alternative is to drive a bit longer up the road towards the Norwegian border for a shower. We've negotiated with Reino Fofonoff, the owner of Nitsijärvi Cabins, for the use of his hot showers for a modest fee. Reino can also provide you with more drinking water and the use of the sauna in the fall. Nitsijärvi Cabins has an English-language website with detailed instructions on how to get there. The Aihkiniemi cabin has a smoke detector and a fire extinguisher. There's no closet space for your stuff, so you'll have to pile most of it on the floor and tables, or just keep it in your luggage. You may find it surprising, but there's good cell phone coverage even in the middle of nowhere, so the cell phone network is the way to have Internet connection in the cabin. Carry your cell phone when checking the antennas or walking in the forest in case you get lost or hurt yourself. Be sure to check that your cell phone operator has roaming agreements with the major Finnish operators or get a prepaid SIM card on arrival in Finland. Airtime and data are very cheap in Finland. Instructions for obtaining the key will be given to you after reservation. We recommend that you fly first to Helsinki and then to Ivalo. 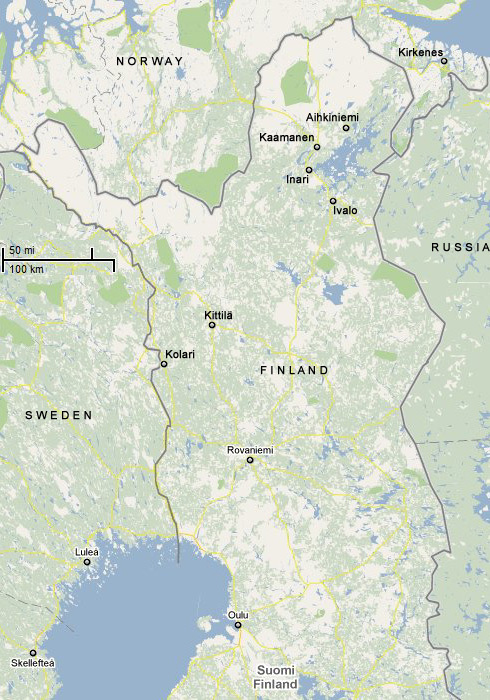 From there, you can rent a car and drive to Aihkiniemi in two hours. Alternatively, if you don't mind the extra driving, you can fly to Kittilä (a ski resort in northwestern Lapland), Rovaniemi (on the Arctic Circle) or Oulu (an IT industry boomtown further south) and drive from there. Flying to any of these destinations has just become cheaper thanks to increased competition. In addition to Finnair, you can fly with Norwegian, which often has cheaper deals. If you have more stuff than you can take along in a plane, and you have more time, you can take an overnight train from Helsinki to either Rovaniemi or Kolari (the northernmost railroad station), and rent a car for the rest of the journey. You can check the schedules and purchase the tickets from the national railroad operator VR online. 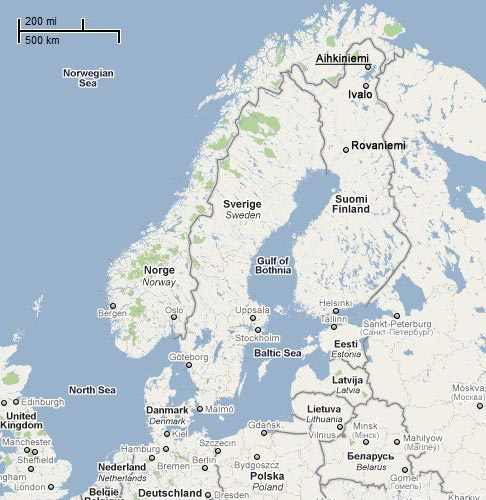 Of the two northern destinations, driving time from Rovaniemi is shorter and also the road is better than from Kolari. The Ivalo airport is located 8 kilometers south from Ivalo downtown. Ivalo is the best place to shop for groceries, for winter clothing if you need it, and the last point where you can find a liquor store (Alko). At this intersection you leave the main road (4/E75), and turn right on road 971. Still 43 kilometers to Aihkiniemi. From Ivalo, drive north along highway 4 (also known as E75), through Inari until almost Kaamanen. After 63 kilometers, you'll come to an intersection pointing to Kirkkoniemi, Näätämö and Sevettijärvi. Turn right on the road "Sevettijärventie" (number 971). From this point on there are no services, so be sure you have all the food and gas that you need. The road becomes narrower, and you'll need to be very careful with oncoming traffic. You can get more detailed driving instructions after your reservation. In case you've ever wondered why many signs in Finland have two versions of each place name: the one on top is in the dominant language spoken in the area  most often Finnish  and the one on the bottom is the minority language. In southern coastal areas, it's often Swedish. 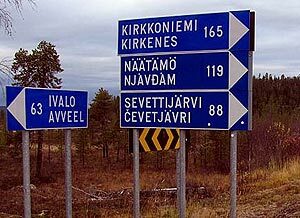 In Lapland, it's one of the three dialects of Sami, which is the native language for a few thousand people in Finland. If you arrive in winter, there'll be some snow on the driveway of the cabin, so drive carefully. 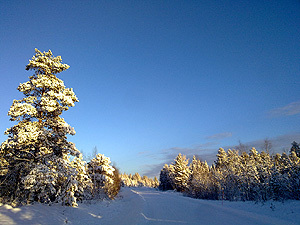 The main road is kept in good driving condition throughout the winter. You're guaranteed to see reindeer on the road at some point, so drive with caution. Hitting a reindeer is only lethal to the reindeer, but there are also tall moose, which can come through the windshield if you happen to drive into one. 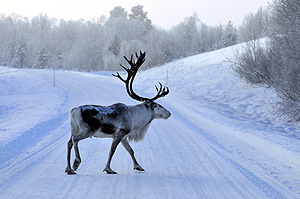 All public roads in Lapland are open throughout the winter and are well kept, but they will still be icy and snowy. While we have the antennas, you'll need to bring your own receiver(s), power cables and other cables, an antenna selector, and a preamp/amplifier. A splitter without an amplifier is available in the cabin. You'll probably also need earphones, and loads of external hard drives to store your catches. A compass and a GPS, USB wires, etc. can come in handy. It wouldn't hurt to have basic tools to fix coax connections and antennas, although some tools can be found in the cabin. The environment is largely free of interference, and the most likely sources of unwanted sounds on the dial will be your own power sources, so at least for your laptop(s), it may be wise to use the power sources that we have provided. Check out the Finnish plugs beforehand, because you may need to bring along shape adapters or even voltage transformers (for 230V). You won't find them in the grocery stores in Lapland. The small lake next to the cabin may look like it's frozen, but it is essentially a slow-moving river, so find a narrow and shallow part to cross, look for the most solid ice, or use a bridge further downstream. We have a rowboat that can be used until October. There'll be snow  lots of it. And it'll be cold. In terms of outdoor clothing, be prepared for any kind of weather. The temperature can vary between freezing point and minus 40 degrees, even lower. Rubber boots or other water-resistant winter boots are a good idea unless you visit in February when everything is frozen solid. Power outages are rare and short, but bringing a flashlight is still a good idea, because it will be dark outside most of the time. Two UPS units with four power outlets each are available in the cabin to enable you to continue DXing even in case the power goes out. Plan carefully in advance for what you might need. Remember, it's a long drive to the nearest store, especially for toilet paper  which is why we store a lot of it in the cabin. Supermarkets in Ivalo are large, well-equipped and accept all major credit cards. There are smaller grocery stores in Inari and a tiny one in Kaamanen. ATMs can be found both in Ivalo and Inari. The nearest library with free Internet access is in Inari. If you have used any of the pans, pots or kitchen utensils, please boil water and do the dishes before you leave. It can be a bit cumbersome. Alternatively, you can buy paper plates, cups, and utensils on your way to the cabin. In any case, please clean the kitchenette. When you leave, please take all your trash with you. You can drop it off at large roadside bins, the nearest one of which is located in Käyräniemi close to Matkapaikka Jounila. Half of the original Aihkiniemi team, from left to right Jari, Lauri, Jarmo and Olli. The cabin is available on a first-come, first-serve basis. Most likely September and October are booked solid by us, and openings can generally be found from mid-November. If you email Jari Sinisalo, he can let you know about availability. If you're traveling alone, you can inquire about the possibility of joining one of us for a DXpedition week. Rent for the cabin and antennas is 700 euros a week. If there are two DXers, it comes to 350 euros per person. The rent must be paid in advance at the time of the reservation into our association's bank account. Your reservation is confirmed once we have received your payment. What to do in addition to DXing? You might want to consider combining your DXpedition with a more traditional vacation trip in Finland. Saariselkä, one of the largest ski resorts in Finland, is located just south of the Ivalo airport. So, if propagation conditions happen to be exceptionally poor, you can take advantage of the slopes, relax in a spa, or enjoy after-ski partying. For something cheaper, but equally impressive, you can watch the aurora borealis, the northern lights! Further south, you can meet Santa Claus in Rovaniemi or cruise on an icebreaker or visit the largest snow castle in Kemi. This is what Saariselkä looks like in the winter, so don't spend all of your trip just DXing. 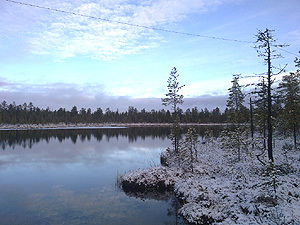 For more information about visiting Finland, check out the Finnish Tourist Board website, especially on winter travel. 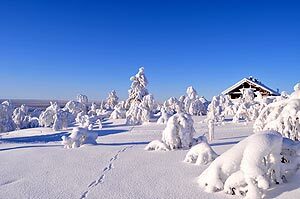 Compared to most destinations, Finland is very safe, clean and organized, so even if midwinter is weather-wise not the ideal time to come over, it is still an opportunity not to be missed. The capital, Helsinki, has loads of sights that you can experience year-round, from modern architecture, opera and dozens of museums, to nightlife and gourmet dining. 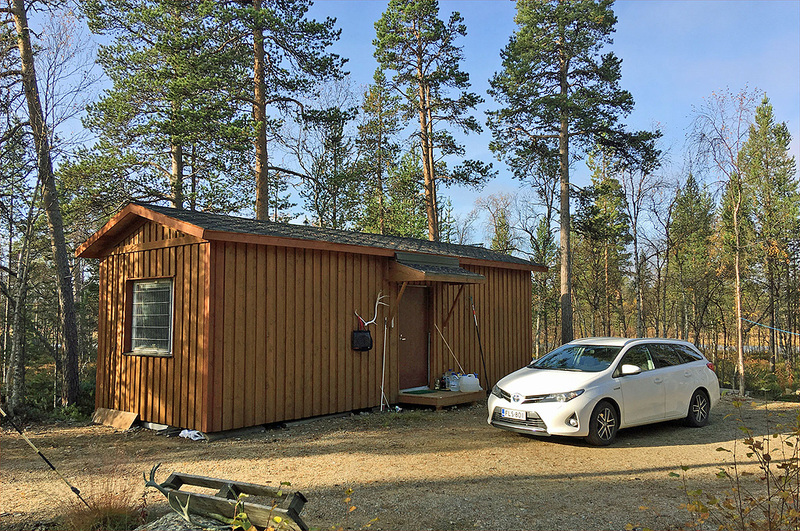 In case you happen to be traveling in Lapland during the summer, you can rent the Aihkiniemi cabin for any period of time for half of the winter rate. It's a good base for exploring Lapland, and in the summer you can enjoy 24 hours of daylight, which is an experience in itself. There are ample opportunities for fishing, hiking, and picking wild berries (which you can do even without landowner's permission). 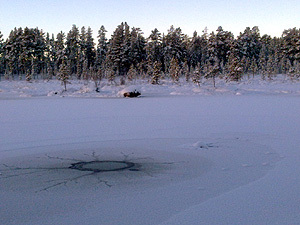 In Lapland you can even try your luck in gold-panning. We own fishing rights in some areas of the surrounding wilderness, so when you rent the cabin, you can fish in these areas. And we have lots of coveted cloudberries in and around our property in early August. As for your luggage  add mosquito repellent and delete your radio equipment; there's not much to listen to on the AM band in summer. In Finland most people understand English well enough to be able to help you, so getting around and finding what you need is easy. Be in touch if there's anything more that we can help you with in preparing your DX vacation of a lifetime! Welcome to our paradise! "This is an amazing QTH! Extremely quiet, which allows reception of signals that would be impossible to even detect in a populated area. For those of you, who never have experienced a real DXpedition, I can recommend a trip to Aihkiniemi without any hesitation. The location is easy to access from just about any direction, accommodation is excellent and the price tag is very sympathetic. All in all, I would say that one week in Aihkiniemi represents the Best Bang for The Buck!" "The background noise of this far north location is so low or even zero at AIH DX Cabin ... As you should see Venice, New York, Rome or Paris once in your life, the same must be said for this extreme DXing experience. Apart from the sheer number of new entries, you can enhance your experience which can be poured to everyday listening experiences."